Strawberries are coming into season, I love this salad, its easy and delicious. I absolutely love this, its aged and sweet the best I ever had, and I like that the bottle is refillable. You buy the bottle filled for $11.99, then when you are out you can refill it for $6.99, best deal in town if you ask me. So for me I use it all the time, oh even on vanilla ice cream, with sliced strawberries…YUM!!! 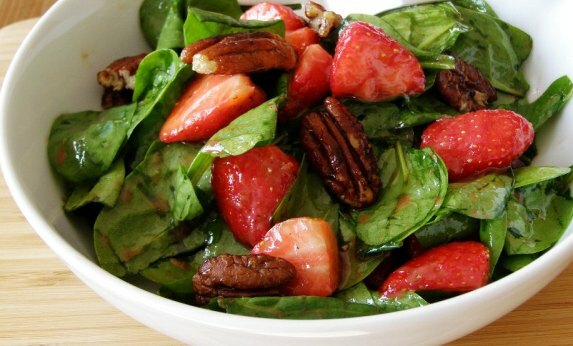 In a large bowl add spinach, strawberries and ½-3/4 cup of the vinaigrette, toss to combine. Turn out on to a large serving plate arranging strawberries all round. Top with glazed pecans. Pour remaining vinaigrette in a container, in case any one would want more. You can serve this as the main entree or as a side with a frittata or quiche Frittata recipe to come on Monday.